On 21 October 2017, the follow-up exhibition of The Sea – salut d’honneur Jan Hoet (2015) will officially open. The theme of this triennial international exhibition, which is organised for the second time, is “the raft”. “The Raft. Art is (not) Lonely” examines the vessel and the emotions that art inspires. The exhibition is held in 22 venues across Ostend. Het Vlot. 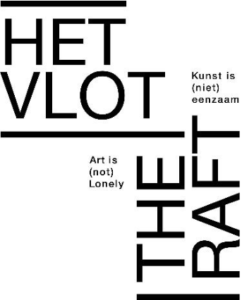 Kunst is (niet) eenzaam / The Raft. Art is (not) Lonely runs until 15 April 2018. The exhibition’s curators, Jan Fabre and Joanna De Vos, have worked hard in recent months to make a selection of 73 artists, including (inter)nationally established artists and young talent. The 22 venues have also been carefully selected and often stray from the beaten path. The main location and starting point of the exhibition is in Mu.ZEE, but less obvious locations such as De Peperbusse, the law courts, the Europa centre, the crypt of St. Joseph’s Church, and many others have also been included in the art walk through the city. 52 artworks were created especially for The Raft. Art is (not) Lonely , which also includes a programme of 18 performances. Festive opening on 21 October at 7.30 p.m. The exhibition dramaturgy begins in Mu.ZEE with an in-depth exploration of The Raft of the Medusa (1818) by Théodore Géricault and Jan Fabre’s utopian raft, Art is (not) Lonely (1986). Unmistakably separated in time by 170 years, and created in completely different circumstances, the works are nevertheless linked through their depiction of the expedition and destiny of the artist, a theme which also serves as a metaphor for the condition humaine [man’s fate]. Jan Fabre’s utopian raft as well as the studies preceding Le radeau de la Méduse (The Medusa’s Raft) by Théodore Géricault will be on display during the exhibition; they served as the conceptual models with which the participating artists established a connection. A raft is a vehicle, a lifesaving device, a place of isolation, reflection, uncertainty, insight and coming together. It symbolises a journey with a clear destination or an adventurous quest lacking direction. A raft can be understood as a symbol for manifold interpretations. You can also call it a metaphor for the ecstasy that art can instil. A storm, a shipwreck, a raft at sea. A handful of survivors cling to life. They want to survive. This theatrical and semi-romantic image inspired many eighteenth and nineteenth century artists. Turner lashed himself to the mast of a sailing ship to gain first-hand experience of the savagery of ocean storms. He translated his impressions directly into his work. Théodore Géricault was profoundly shocked by the wreck of the Medusa, a French frigate that sank in 1816, and he immortalised the few survivors clinging to their raft in numerous pencil sketches and a large oil painting. Loneliness, fear and despair, the will to survive, to live and therefore, if necessary, to take another life … these gruesome aspects lead us through the history of the nineteenth and twentieth centuries to current events. Many artists have imagined themselves upon that raft and endeavoured to appropriate the distress and hardship, and translate it into a work. It is not only the tragedy that is inextricably linked to this theme, but also the sense of adventure. The explorer who sets off in curiosity! The Raft of the Medusa caused an intellectual and emotional furore when it was first exhibited by Théodore Géricault. The sophisticated composition, in which he focused on the human drama and the changing status of the artist, remains etched in the memory as a sharp indictment of the royal family and a hidden reproach of slavery. That the work should provoke such a violent reaction is hardly surprising, since it was the first time that an artist had so explicitly capitalised upon a topical theme. Questioning the establishment was simply not done. But what, specifically, was the artistic dimension that became overshadowed by the socio-political angle? Géricault’s raft represents the desolation of the artist after the Ancien Régime, who found himself cast adrift, as it were, due to the gradual disappearance of the traditional patrons. That many generations have perceived the ‘total creative freedom’ that ensued as both a threat and a gift. The artist, no matter how alone he might feel on his journey, is not lonely. It is double-edged sword: on the one hand, the artist needs solitude and introspection to provide direction; on the other hand, the artist’s raft is propelled by the desire for connection and spectacle. These ever-shifting moods, which veer between hope and despair, promise and oppression, vision and blindness, illusion and reality, can be shared through art. The title of a conceptual model from the 1980s, Art is (not) Lonely is a miniature world that conveys Jan Fabre’s vision of the artist. His raft has been kitted out with a gymnasium, athletics track and football pitch: a sorrow shared is a sorrow halved. He refers to the endurance of hope in the face of catastrophe. Art and communication as the forces that drive us towards a promising destination. Jan Fabre and Joanna De Vos asked a number of contemporary artists to give their own interpretation of the theme of the raft, within this thematic framework and the dramatic composition of this exhibition. In the panorama of the North Sea and at all layers of the fabric of the city 73 artists share their creations. Their work often bears witness to a dichotomy, in which quiet isolation and social engagement are equally important. The staging of the exhibition is intent on challenging boundaries. Some of the visual artists are also engaged in other disciplines, such as film, theatre and performance art. Existing work, as well as 52 new creations, will be on display at 22 familiar and surprising locations. Additionally, at least fifteen artists will be presenting a unique performance. Art is the medium for communication; art demands and creates connection. Art is lonely, yet is not. The urge to communicate and exchange ideas and opinions is expressed immediately in performance art. The physical body is used as a raft of experimentation and transition, to which the audience is both witness and participant. The City of Ostend will become a large, hospitable raft of art during the Triennial. It offers its body and soul to look beyond the familiar framework, because it is precisely in this that the foundation of discovery and rediscovery lies ensconced. Art must disturb and enchant. The story behind Le radeau de la Méduse (The Raft of the Medusa, 1818) that inspired Géricault to create one of his masterpieces. The painting is based on the infamous shipwreck of the French frigate Medusa, which occurred in July 1816 as the boat sailed the Atlantic Ocean just off the west coast of Africa. A large raft was built on deck, nicknamed ‘la Machine’, which was destined to save the lives of the almost 150 people on board when the ship sank. Subsequently abandoned to their fate by the captain and officers, the survivors were left without food or water. Between 5 and 17 July, the raft was at the mercy of the sea. When it was eventually recovered by a sister ship, the Argon, only fifteen people were still alive. The others had starved to death, been pushed overboard or eaten. The disaster was taken as a subject by many important painters, among them Géricault, who used it as inspiration for The Raft of the Medusa. In keeping with the Romanticism of the 19th century, it was less the horror that Géricault wished to bring to his large-scale canvas, but the emotional poignancy of the event. The work embodies hope and incipient freedom, but also an illusion. A wealth of reactions, ranging from despair to false hope, are captured within the painting. The ship itself is barely visible, which heightens the sense of emotion; the ebb and flow and shifting spirits are depicted with great precision. Every aspect of the scene was studied and carefully planned by Géricault, who transferred the entire composition to a canvas measuring 5 by 7.5 meters in the autumn of 1818. Central to the story is the dot in the distance that indicates the sail of the indiscernible rescue ship. But the viewer initially notes the towering waves and cloudy skies that surround the raft. The attention is then drawn to the gesticulating survivors, who point to the ship and, in so doing, draw the viewer into the composition. Razor-sharp realism and an ambition to work on a heroic and monumental scale characterise this work by Géricault. The artist used live models and, to the greatest possible extent, preparatory studies of corpses, decapitated heads and severed limbs. Although his painting touches the limits of the perverse, morbid and fantastic, it essentially remains a realistically painted indictment. On 25 August 1819, The Raft was exhibited at the Salon in Paris under the title Shipwreck. The work provoked outrage in certain quarters. Some viewed the painting as a political arraignment of the incompetence of the royalist captain of the Medusa. Others were concerned by the black figure on the raft and suspected a hidden indictment of slavery. In short, the political significance of the painting overshadowed its artistic merits. The painting also has a deeper meaning. The Raft of the Medusa alludes to the changing role and status of the artist after the Ancien Régime and the disappearance of the conventional patrons such as the nobility, clergy and bourgeoisie. Artists no longer painted to commission and were expected to devise their own assignments. The artist was cast adrift, so to speak, without any mandatory guidelines (in terms of style or subject), and found himself drifting across the waves, rudderless and confronted with the prospect of total freedom. In around 1880, this lead to the emergence of the various ‘-isms’, successively Impressionism, Expressionism, Symbolism, Cubism and so on, with art giving material form to the internal agony of the artist.